Taj Exotica is located on the exotic Emboodhu Finolhu Island, in the middle of one of the largest lagoons in the Maldives. This tropical island, once known as the ‘Three Coconut Island', is surrounded by crystal blue waters and covered with lush tropical flora. 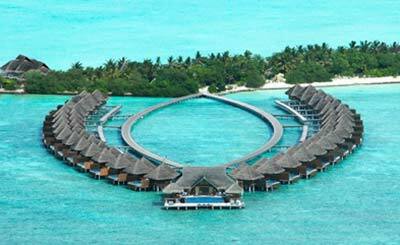 The resort is just 15 minutes by speedboat from the Male International Airport. 24 Degrees: The all-day dining restaurant with a display kitchen, offers a variety of Pan-Asian and European comfort food, and a fine selection of wines. Equator Bar: Savour the soothing sounds of nature with a choice of refreshing beverages at the stylish bar. The Deep End: It offers an extensive a la carte menu inspired by European and Mediterranean cuisines. These villas have a private sundeck and loungers, offering infinite views of the Indian Ocean. Stand alone villas offering complete privacy & featuring a private sun deck with fresh water plunge pool. These villas are luxuriously styled with an oversized plunge pool, private verandas with sun beds, tropical outdoor showers and an infinite view of one of the largest lagoon in Maldives. The villas are luxuriously styled with an oversized plunge pool, private veranda with sun beds, tropical outdoor shower and an infinite view of one of the largest lagoon in Maldives. Built on stilts over water, it is luxuriously styled with designer fittings and furnishings, a large private deck area and an oversized private plunge pool. 2-Bedroom Villa Suites are situated on the beach just 5 meters away from the pristine Lagoon. Luxuriously styled with designer fittings and furnishings, each Villa has a living room, a private courtyard and an oversized private plunge pool. This tastefully appointed award winning villa boasts of a living room, a master bedroom with attached his and hers bathrooms, a guest bedroom & a glassed bathroom with an infinite view of the Indian Ocean. A fresh water pool with a private sundeck, two `salas’ for relaxing and dining; and a beautiful suspended deck filled with powder soft sand and a hammock suspended over the beautiful turquoise lagoon.